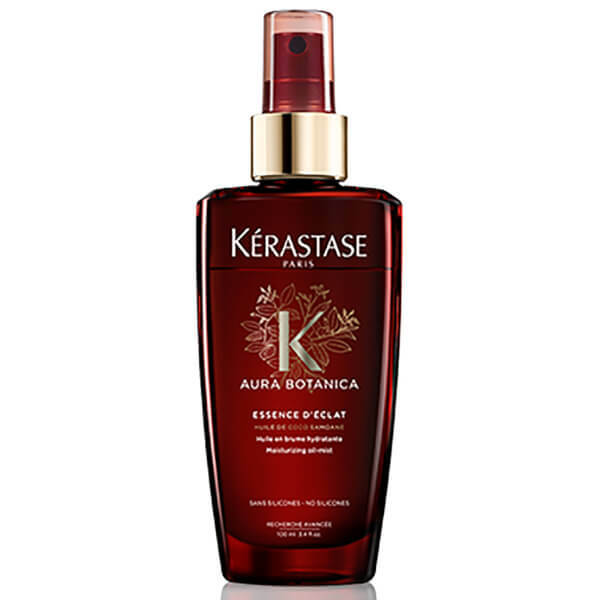 Revive and revitalise dull hair with Kérastase Aura Botanica Essence d'Éclat Oil, a bi-phase oil-mist from the brand's natural haircare collection. Utilising 96% natural origin ingredients, the lightweight, bi-phase formula combines four nutritious oils (Jojoba, Avocado, Coconut and Argan) with an aqueous solution of organic Damask Rose Water; the two layers work in synergy to infuse hair with nutrition, moisture and frizz-fighting benefits. The leave-in treatment can be used as a hair primer before blow-drying, or for misting over dry hair to enhance softness and radiance. 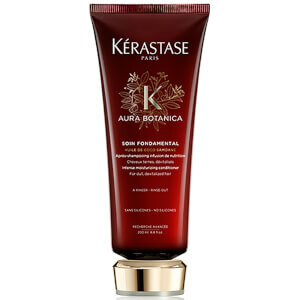 Hair looks rejuvenated and is delicately perfumed with an aromatic fragrance. Free from silicones and parabens. Shake well to blend formula before each use. As a primer: Spray onto lengths and ends of towel-dried hair, air-dry or blow-dry. 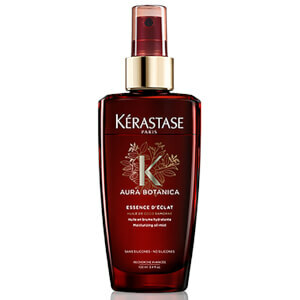 For a touch-up: Mist over dry hair to boost softness and glow. For even distribution, spray into palms and run fingers through the lengths and ends. Aqua / Water, Rosa Damascena Flower Water, Simmondsia Chinensis Seed Oil / Jojoba Seed Oil, Persea Gratissima Oil / Avocado Oil, Argania Spinosa Kernel Oil, Cocos Nucifera Oil / Coconut Oil, Propanediol, Sodium Chloride, Salicylic Acid, Sodium Benzoate, Arginine, Citric Acid, Xanthan Gum, Linalool, Citronellol, Limonene, Hydroxycitronellal, Hexyl Cinnamal, Citral, Tocopherol, Citrus Aurantium Dulcis (Orange) Peel Oil, Helianthus Annuus Seed Oil / Sunflower Seed Oil, Rosmarinus Officinalis Leaf Extract / Rosemary Leaf Extract, Parfum / Fragrance. C190667/1.